Sometimes good things happen totally by accident and that exactly was the case with this book. I came across this one while browsing Amazon, searching for some good or at least decent books in German to buy and read (as a means to keep my German alive). It’s obvious that this book was originally published in English (as ‘Inked’ in 2008) but the German edition isn’t bad. The main person behind it is Carey Hart. For some he’s a damn good motorcycle racer while for others he’s Pink’s husband. In this book he speaks up for himself and let me say that he has some interesting things to share. Credits for the way this book looks should also go to Chris Palmer, Bill Thomas and – last but not least – to all the people connected one way or another with Hart’s business, ‘Hart and Huntington Tattoo company. The idea behind this book is not new and we have seen it before in other books but is there anything wrong about letting people share their minds and feelings? Tattoos have had very bad press for a very long time, so the more we hear, see and read about the positive/ bright side of tattoos, the better for all of us. 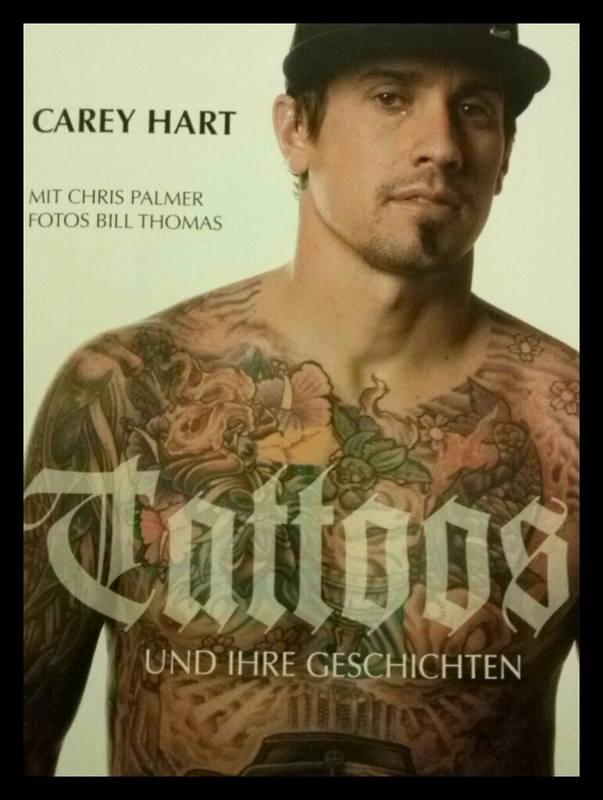 The book starts with a foreword by Hart himself in which he shares his life story and tells the readers about his life-long passion for tattoos. Many of us can relate to it and that’s why he sounds convincing. 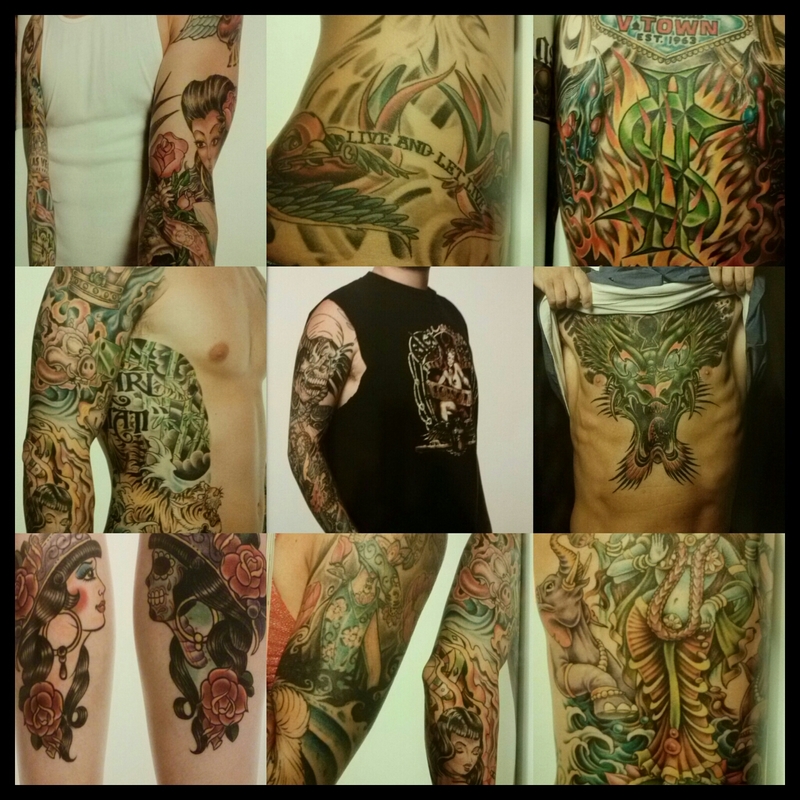 The same motif of love for art and self-expression appears in many of 42 portraits/ profiles of tattooed people shown here. These people are as different and interesting as their tattoos – dancers, limo driver, bank employee and tattoo artists gathered around the Hart and Huntington shop(s). They are all different but they also have something in common – they love life, beauty and Las Vegas. Besides the people’s profiles there are also short texts focused on history of tattoos (it starts with Oetzi and ends with Hart’s achievements which is both Hart-centric and humorous! ), inside info on tattoo business and many good pictures of people and their tattoos. It’s a good read for everyone interested both in tattoos as art and tattoos as a part of pop culture. It also gives a fascinating insight into people’s lives and what drives them to change their bodies and fight (altought not overly vehemently in Sin City) for their right to be who they want to be.